Gojaus Inn is close to the road Vilnius - Utena, near the town Moletai in Gojus village on a bank of Lake Kirneilis. Guests from abroad and guests tired of city noises are welcome in our wooden house with nice nature, fresh air, lake breeze, a boat and a sauna. For rent is a wooden house with sauna for 5 persons that is renewed in 2001, and there is a small wooden house with veranda for 2 persons. 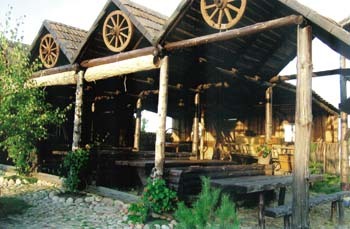 Gojaus Inn is a member of Auktaitija (Lithuania's geographical and ethnical region) cuisine heritage organization. Thus, be a guest in Gojaus Inn and try the food cooked here. Dishes are both very well known today or very old cooked according to recipes told by grandmothers and great-grandmothers and for some altogether unknown and not tried yet.